Your home theater system is as grand as whatever devices you equip it with. Most full home theater systems include at least cable or satellite TV, at least one video player (like a DVD player) and a full surround-sound system. You can connect all of these devices to an HD TV set, but you must choose which type of audio/video connection to use for each device. Most HD TVs have enough connections for all your devices. Connect the TV set's digital audio output to the input of the stereo system's central receiver. Depending on the available connections for the TV and receiver, this may be a coaxial (orange RCA style) or optical (box-like) connection. Attach each of the stereo system's speakers to their correct output connection on the central receiver. Each output is labeled for each speaker--a system usually includes six to eight main speakers plus a subwoofer. The red/black wires connect to their ports with the switch-like clamps. Hook up your cable/satellite receiver box to the TV set. Your best connection here may be either the RF/RG coaxial connection (the cylinder-like threaded connector) or RCA composite (yellow, red and white plugs), saving the others foe your other devices. Connect your DVD player to the TV set using either the RCA component connection (red, green and blue video cables that go with red and white RCA audio) or the high-quality HDMI (which uses the thin trapezoid-like connection). Add any extra video device, like a Blu-ray disc player, using any video connection that remains; the connection from Step 4 that remains available is best. Plug in a surge protector into the nearest AC wall socket if you don't have enough nearby sockets for all your devices. Use a surge protector with more sockets than you need to prevent overloading it. Plug all devices into the available sockets. If your theater system includes a digital video recorder, connect the satellite/cable receiver's output to the DVR's input and the DVR's output to the TV's input. S-video (the circular connection with the five pins) is not recommended for any video connections. 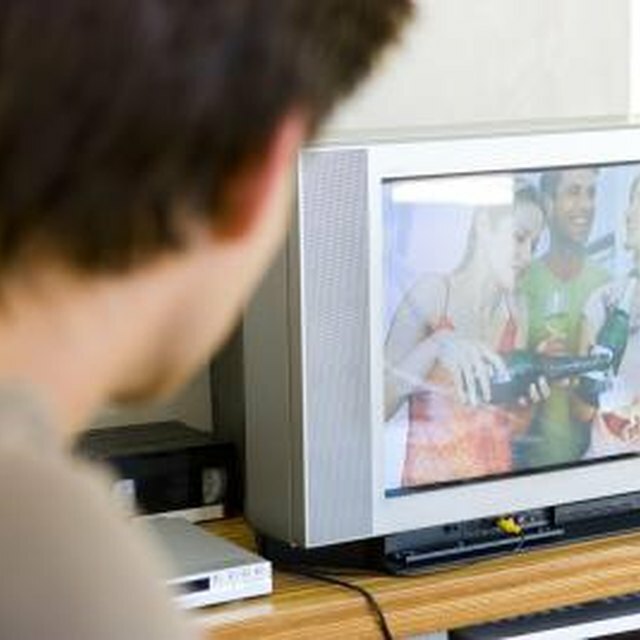 Depending on the cable you use and the device's output, it may give you worse quality than an RCA composite connection.